This past Sunday, I fumbled in the darkness to lift the ringing receiver and placing it back into its cradle as quickly as possible as to keep the kids in their sleep state at 4:15am. Most likely it disturbed their REM sleep, however none of them paid any attention to the wake up call commotion. It seems that I have gotten use to prepping for race day, and the nervous butterflies that use to bounce around in my belly have been trained to stay calm. Unceremoniously, I put on my running gear donning my trusty Team for Kids Singlet, and new ASICS Nimbus Running Shoes. Pecked everyone one the cheek, except for Zachary who seemed to be tucked away on the other side of the bed, so I kissed my hand and transferred it to his cheek. Walked out the door and headed down to the lobby and waited for my brother in law, Raymond. He pulled up in his rented Blue Honda Civic with his fiancé, Frances. Since he did not have a GPS, I lead him in the wrong direction for the first 5 minutes of the trip to the Jersey Shore. Make a mental note, can’t not always rely on GPS to get to where you are going, need to remember past mental maps! By the way, where is that seat belt! We arrived at Seven President Park, which was about a ½ mile north from the Start, and did our best to get some additional shut eye, but that did not work. So we just relaxed. It turned out that we parked right next to Coach Vincent Corso from Team for Kids. This person is such an inspiration from weighing 310 in 2006 to running a new personal record in 3 hours and 12 minutes later that afternoon! What a great success story! I will be running that fast soon! Finally, it was time for Ray and Vinny to depart for their New Jersey Marathon Start. I stayed behind and rested a little more with Frances who was trying to watch a movie of some sorts on her phone. About a half an hour later it was my turn to head to the start as the Full Marathon began heading my way. The lot was adjacent to part of the course, so I walked along and cheered on the runners as they ran towards me. I was fortunate to see Coach Vinny wave and acknowledge me with a thumbs up. I searched for Ray, but I think the crowd engulfed him. I’ll catch him at the end. As I got closer to the starting line, I saw many people jogging to warm up, so I did the same. Usually the first 2 miles are miserable, because my legs need some warming up. Most races that I have participated in had corrals to separate the masses. With this race, it seemed that you can just jump right in, as long as you had enough space to hop over the fence and squeeze next to the other runners in this fenced off sardine can. Surprisingly, just another 20 feet stood the sandy Jersey Shore, however no spectators were able to cross to that side and cheer on the runners. I looked for the 2:20 pace runner balloon and got in line where someone had separated the fence. Eventually we started to move forward, with Bruce Springsteen blaring away in the PA system and the Race Announcer did his best to rally this very subdue crowd. Finally up to a slight jog across the start and off we go! The course wrapped its way around the suburban streets of Long Branch, simple homes with some neighbors out to cheer on the runners. Right before Mile 4, at the very shallow Port Au Peck Bridge, a girl said to her running mate, “I thought this race was suppose to flat.” I thought to myself, she has no idea what hills are. It was a joy to run on a “flat” course! A little after mile 4, I noticed that I was getting closer to a pace runner. A few minutes later I was very close to be able to see the time 2:15. I was like, “WOW!” that was unexpected. I pulled up next to her and stepped on the gas to pass her. I wondered if I could keep this speed up. The only time I ran this fast previously was during much shorter 5k’s or 4 milers. It felt good and did not look back. I kept on looking at my Timex Global Trainer, which helped keep my pace under 10:00, and when I notice it above 10:00, I accelerated. The whole time, I kept on saying “make up some time now incase I crash in the later miles”. Also during this run, I held everything in. I past each porta potty and tree and also repeated, “Do not go, Do not go, Do not go!” Unlike the Disney Marathon, where there were trees everywhere and women would pop out the woods after taking a break and men just stopped and smelled the Orlando air, there were houses and neighbors everywhere. I am pretty sure that they would not appreciate the extra watering. At Mile 9, I was getting ready to give my kids some High 5’s and when I reached Mile 10, I kind of gave up looking for them and sped up. Then suddenly I hear, “Noah!” to my left. I looked over my shoulder for my blind spot and headed over. Only Zachary was close enough, and he jumped up like Michael Jordan and reached for my hand. A mother sighed, “Awwwwwww” in the background. I was so happy to see them! 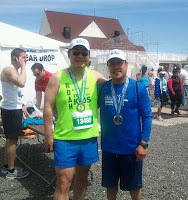 At Mile 12, I started to see spots and the road seemed to be leaning, meaning that I was running on empty or bonking. I said, "Just don't fall on your face before the finish line!" and the finish line could not have come faster. 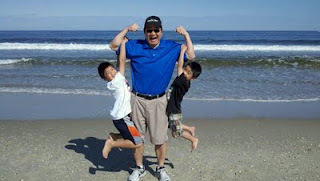 My thoughts about Irene and the kids helped me reach the final yards. I am so looking forward to all of us doing the same race! As soon as I saw that Green Gate, it put a little more spring in the step and I sprinted to see if I could cross before the clock said 02:17:00. I stopped the looked at my watch showing 02:09:00. 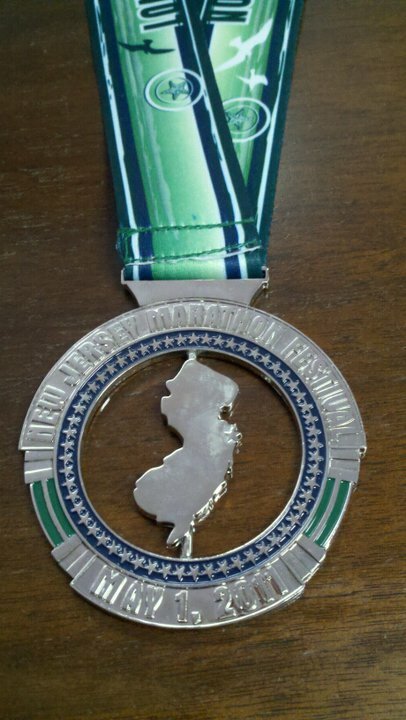 The New Jersey Half Marathon official time was 02:08:58.73, a 09:50 pace. My slowest was the last mile at 10:15 and at mile 6 where there was a slight incline from an overpass I wish I started running and doing P90X a lot sooner. Well, I can say that about alot of things! Now my next stop will be on my Wedding Anniversary weekend at the end of the month. We will be celebrating at the Vermont City Marathon in Burlington, VT. I will be running and Irene volunteered to give out food to the finishers. I think we will be making a pit stop at Ben and Jerry’s while we are there! Again I would have to say my favorite big race still goes to the NYC Marathon with its crowds. Just a reminder to everyone, if you want to run the New York City Marathon, run it with Team for Kids and help stop childhood obesity! Also, if you or know someone that is interested in a running, walking, P90X, getting fit, lose weight, or eat better give me a call! Watch Darin Olien Hunt for Superfoods!